The Office of International Students at the Penn State University publishes a weekly newsletter “Global Lion” and features stories about various aspects of the foreign students’ life at Penn State. In the current issue, a story about the long history of the beautiful game of Cricket at Penn State, written by yours truly, was published. Click on the following picture to open the link (PDF) and skip to page 12 to learn about the many lives Cricket has lived at Penn State. 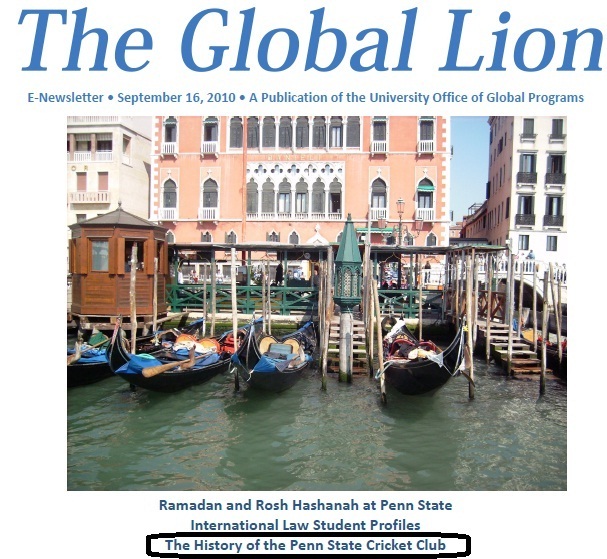 This entry was posted in Penn State and tagged History, Penn State, Penn State Cricket Club. Bookmark the permalink.